While establishing a causal link between Zika and Microcephaly may still be months away, as more pregnant women are diagnosed with the infection (including via sexual transmission), some public health agencies around the world are doubling down on their travel advice for pregnant women. Previously the UK `encouraged' pregnant women to consider avoiding travel to areas where Zika is spreading, today they change that to recommending that pregnant women postpone non-essential travel to such areas until after pregnancy. 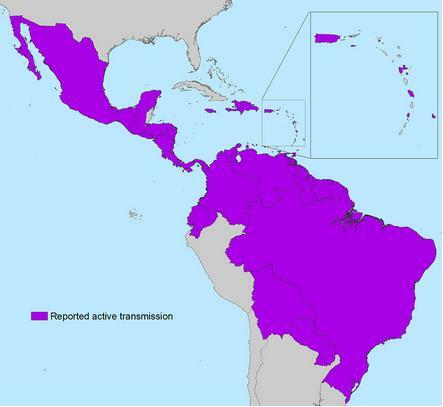 It's an incremental change, signifying a ratcheting up of concern, but it also gives the PHE another opportunity to repeat the message, and their advice on avoiding the sexual transmission of the virus from male partners who have recently traveled to Zika prone areas. Pregnant women advised to postpone non-essential travel to areas with active Zika virus transmission. If a woman develops symptoms compatible with Zika virus infection on her return to the UK, it is recommended she avoids becoming pregnant for a further 28 days following recovery. Advice has also been updated for healthcare professionals. In the event that travel to an area with current active Zika virus transmission cannot be postponed, the pregnant traveller or those planning pregnancy should discuss with their healthcare provider the risks which Zika may present. In addition, the use of scrupulous mosquito bite avoidance measures both during daytime and night time hours (but especially during mid-morning and late afternoon to dusk, when the mosquito is most active) should be emphasised, and an information leaflet provided.